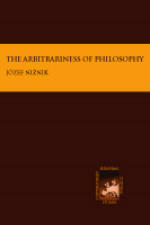 Title: The Arbitrariness of Philosophy Author: Józef Niżnik Series: Contemporary European Cultural Studies Imprint: The Davies Group, Publishers soft cover 142 pp. USD 20.00 ISBN 978-1888570816 November, 2005 Some of the great philosophers believed that philosophy is an art of ‘the right beginning’. The author argues that philosophy itself is the beginning that cannot be justified by anything outside it. The nature of philosophy consists of an intellectual activity that follows its own arbitrary conceptual decisions. Philosophy is an irreplaceable feature of culture, the function of which is to secure cohesion of a human symbolic world, and is, therefore, a uniquely human ability. Illustrating the specificity of philosophy, Niżnik shows how the discipline is coping with a changing human environment and, at the same time, preserving its identity due to its capability for creative arbitrary conceptual creation. Discussing some key philosophical concepts, like ‘knowledge’, ‘truth’ or ‘rationality’, the author demonstrates philosophy’s flexibility in accommodating still newer meanings of those concepts, while maintaining the function of philosophy. In the time of a shattered symbolic world it is philosophy that could possibly offer new ‘orientation points’ that may lead to a new cohesion of a contemporary humanity’s symbolic universum. Contents Preface Introduction: the crisis of identity Chapter 1 Philosophy as a rigorous science: The end of a dream Chapter 2 The contemporary status of philosophy Chapter 3 The idea of rationality and the contemporary status of philosophy Chapter 4 Arbitrariness and sense Chapter 5 Knowledge, truth and society Chapter 6 Emotion as knowledge Chapter 7 The ideological dimension of philosophy Chapter 8 Philosophy and social knowledge. On some connections between philosophy and sociology Conclusion Notes Author Józef Niżnik is co-founder of The International Graduate School for Social Research at the Institute of Philosophy and Sociology of the Polish Academy of Sciences in Warsaw. Most of his research work has been devoted to the theory of knowledge, metaphilosophy, and the intersection of philosophy and sociology. He has authored over ninety major publications in Polish and English— in philosophy, methodology of social sciences, sociology of knowledge and since 1989, in global problems and the problems of European integration—including Socjologia wiedzy, Zarys historii i problematyki (Sociology of Knowledge. An outline of History and Problems); Pogranicza epistemologii (Borderlands of Epistemology); and Debating the State of Philosophy: Habermas, Rorty, and Kołakowski (with John T. Sanders); The Normative Environment of European Integration. Social, Political and Cultural Obstacles to Compliance with European Norms, What is Truth? In Philosophy and in Different Scientific Disciplines (with Hashi Hisaki).